Charming neighborhoods and impressive architecture may not be among the first things that come to mind when one thinks about Alaska, but the state known as The Last Frontier definitely has its fair share of both. The 10 neighborhoods on this list boast myriad examples of the architectural features most associated with Alaska: Victorian-style facades, log-cabin style designs, and the ample use of nature and wildlife, among other things. While some entries on this list are towns so small they have remained the size of typical neighborhoods, others are historical suburbs that have slowly melted into the nearest larger city. In either case, each neighborhood on this list consists of a collection of homes, streets, and parks that appeal to lovers of both architecture and beauty. These neighborhoods are, put simply, the most architecturally charming neighborhoods in the state of Alaska. While its name might not evoke the idea of grand mansions and tree-lined streets, Chicken Ridge Historic District has in fact been one of the Juneau’s most desirable neighborhoods since the early 1900s. Most of Chicken Ridge’s properties are Craftsman, Tudor Revival, and Colonial Revival in style, though an impressive smattering of other styles can also be found. Called the “Nob Hill” of Alaska, “The Ridge” is located at the upper end of the city, where the large, two-story houses are built on patches cut out of the rocks. While it is said that the richest man in Chicken Ridge has a lawn “about as big as three bed quilts,” residents can enjoy stunning views of their natural surroundings. The neighborhood has been listed on the National Register of Historic Places since 1995, and is especially famous for the McCloskey House. Built in 1893, it is the oldest building standing in the neighborhood. With just under 300 inhabitants, Cooper Landing is a small neighborhood located about 100 miles south of Anchorage, in the small town of Kenai Peninsula Borough. Like so many other small towns in Alaska, Cooper Landing was founded by 19th century gold and mineral prospectors, and it has the architecture to prove it. Though some of Cooper Landing’s historic buildings still exist in the form of small shops and cafes, the town has more recently evolved into a popular summer tourist destination and location of many impressive and architecturally modern log cabins. Most people head to Girdwood, located about 30 miles from Anchorage, for its stunning views, spectacular hiking, and even better skiing. 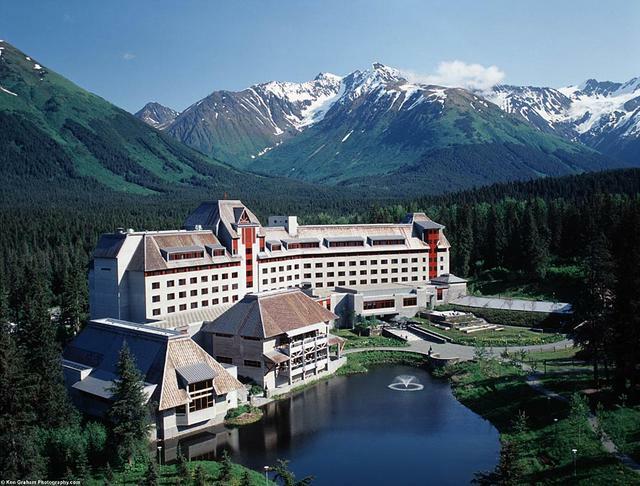 Indeed, Girdwood is home to Alyeska Ski Resort, one of the surprisingly few resorts in Alaska. The beautiful resort includes all of the charm one would find anywhere else, including quaint B&Bs, cafes for a hearty breakfast or lunch, and cozy inns. Girdwood got its start as a supply camp for gold miners with claims near the many nearby creeks, and so the residential areas of town consist of a unique and rustic architecture reminiscent of Alaska’s earliest days. They don’t build them like this anymore! 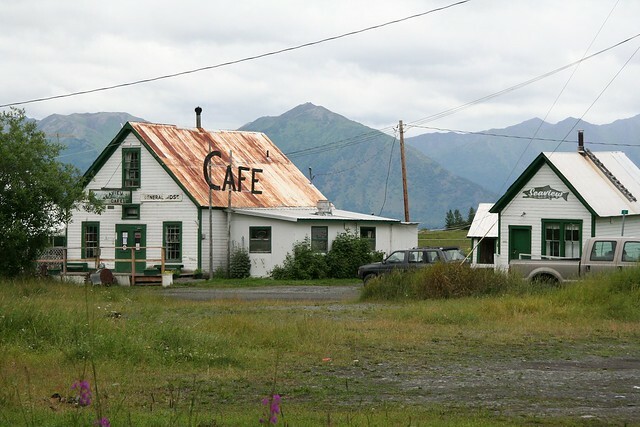 The Hope Historic District in tiny Hope, Alaska is chock-full of the surviving elements of Hope’s former status as a booming mining town. The district is located in the modern downtown, specifically on Main, First and Second Streets, and A and B Streets — the street formerly known as C Street is now submerged during the hours of high tide. Twenty-nine historic buildings, all of which date from 1900-1940, still exist downtown. While some of these stand only as architectural reminders of the past, others have been renovated and repurposed into shops and restaurants. In an effort to maintain the neighborhood’s architectural and historical significance, the Hope Historic District has been listed on the National Register of Historic Places since 1972. Once the area where employees of the Fairbanks Exploration Company worked and lived with their families, Illinois Street is now an historic district in Fairbanks that includes the company’s few surviving buildings, along with a series of residential properties. Most of these houses are small, yet charming, bungalows originally built for employees, while the crown jewel of the neighborhood is undoubtedly the Manager’s House, a beautiful example of the Colonial Revival architectural style. Today, most of the former business buildings have been renovated and/or repurposed into a downtown shopping area. The entire Illinois Street neighborhood was included on the National Register of Historic Places in 2001. Located among a cluster of islands and inlets at Alaska’s southernmost tip, tiny Ketchikan, Alaska has an architectural style reminiscent of its history of varied inhabitants and cultures. Its waterfront streets, with their characteristically colorful buildings, are a joy to wander through, while various parks throughout town display unique elements such as that of the Totem Heritage Center, a unique collection of the world’s tallest totem poles. Some of the best historic architecture can be found on Creek Street. Once a red light district frequented by the town’s population of fishermen, Creek Street is now a popular retail and shopping area. Most people head to Seward, Alaska for their unique cultural events such as The Polar Bear Jump (during which brave souls plunge into the usually frozen Resurrection Bay in January) or the Iditarod Trail Sled Dog Race (Seward is Mile 0), but this historic small town has plenty to offer architecture aficionados and anyone else who likes to stay dry and warm(ish) on a January day in Alaska. While Seward still consists of plenty of impressive historic homes and residential streets, its most impressive architecture is centered downtown. Historic buildings dating back to the early 1900s now house plenty of shops, cafes, and local art galleries, and make for fun viewing for those who appreciate architecture as much as Alaska’s gorgeous natural scenery. Sitka, made famous by the Sandra Bullock comedy “The Proposal,” is a small community located on Baranof Island. Accessible only by air or sea, Sitka is a tight-knit neighborhood complete with a walkable downtown, plenty of restaurants and shops, its own National Park, and an abundance of charm. Despite a wet climate and a foundation-compromising soil called muskeg, Sitka is home to an impressive collection of Queen Anne mansions, Craftsman-style bungalows, and vernacular fisherman’s cottages. Even non-residential buildings are loaded with charm, the most notable being St. Michael’s Orthodox Cathedral, whose patinated copper spires form a classic part of the Sitka skyline. While modern buildings and homes are popping up all over Alaska, tiny Skagway still remains as a glimpse into the state’s frontier past. Once the gateway to the Klondike Gold Rush, Skagway is most appealing to lovers of Old West architecture and lifestyle. Walk down the main street for views of the best buildings, including the local bar, where ragtime music is still played on the old piano. Many of the bar’s neighbors remain unrenovated, though luckily for us, many more have been lovingly restored and repurposed into shops and restaurants. An example of a different kind of man-made glory is the White Pass and Yukon Route Railroad, an engineering feat that ascends over 3,000 feet through the beautiful — yet perilous — mountainscape. A former supply center for miners in the 1890s, and a summertime hotspot by the turn of the century, today Sunrise, Alaska’s Sunrise City Historic District is a living architectural museum of one of Alaska’s most historic towns. Many of the impressive buildings that once housed general stores, saloons, a restaurant, and a hotel declined along with the surrounding area’s mining industry, and the last of the stores closed for good in 1939. Luckily for lovers of both history and architecture, many parts of the Sunrise Historic District have been designated archaeological historic sites in an attempt to preserve the impressive and characteristic architecture, while the entire district was placed on the National Register of Historic Places in 1997.